Pumpkin is the most wonderfully versatile ingredient and this pumpkin curry of Burmese influence is softened with Tamarind with a beautiful mint back note. 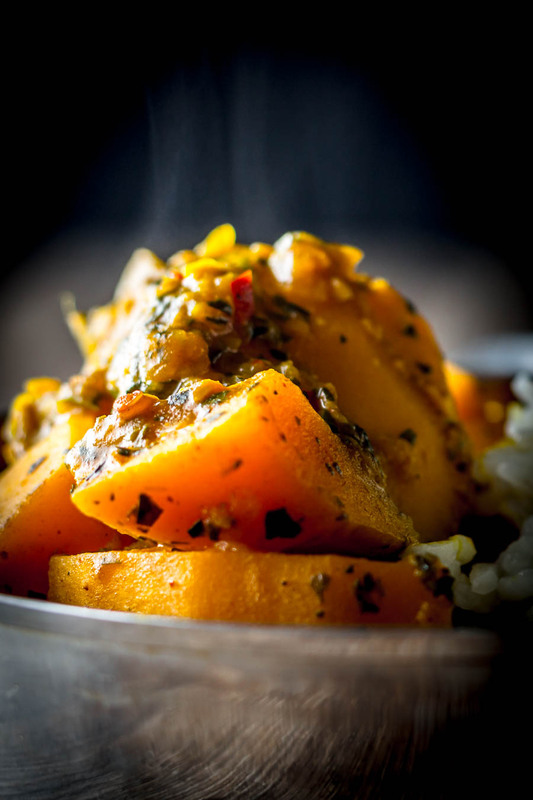 Burmese Pumpkin Curry with Tamarind. I confess to being a bit of a pumpkin ‘newbie’. s a result, this pumpkin curry recipe comes from extensive research from my far too generous cookbook collection. In this instance a great book called Burma by Naomi Duguid. Why am I a pumpkin and squash ‘newbie’? Primarily because pumpkin and squash were rarely used when I was growing up in the UK and because of that I was never exposed to its wondrous versatility. All I had tried was some quite frankly overly sweet soups which kinda closed my eyes to it. However around last year when we were beginning to think about planning our crops for this coming year. We decided to experiment a little and see if we could not find some peace with a vegetable we both thought we disliked. We knew right from the start that pumpkin grows exceptionally well in this climate. The seemingly never never-endings we see full of them at this time of year was a hint. So we were determined to give it a try and plough on through, this Burmese pumpkin curry with tamarind was the very first dish we cooked. Our combined love of spicy Asian influenced food would surely give us a chance. Well, we loved it, not just a little, we cooked this endlessly last winter. Whilst I have played with the flavour profiles a little it still remains the core of the recipe we initially followed word for word. But we did move on from pumpkin curry recipe. Our table is regularly filled with pumpkin recipes. Everything from my pumpkin tagine, but have also stuffed tortellini with it. I’ve even returned to the dreaded butternut squash soup with great results. 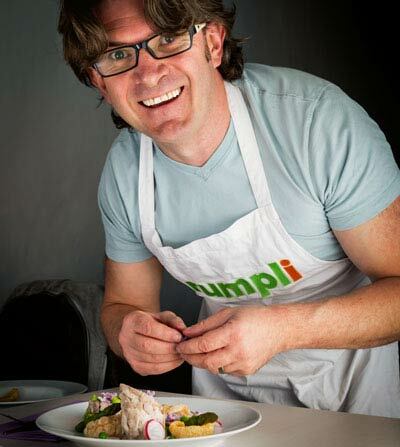 Meat-free recipes here on krumpli are nothing new. I am definitely a full-on omnivore, I eat everything but when it comes to vegetarian food I don’t really do substitutes. My vegetarian recipes are vegetarian because I like them that way and not because I am looking to replace the meat! I’m particularly fond of vegetable curry recipes. 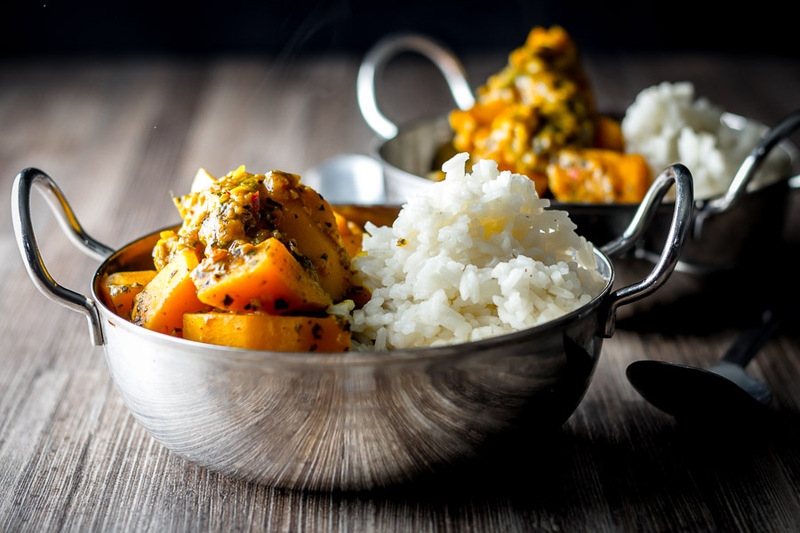 The pumpkin curry recipe is a prime example of taking an ingredient that is often used as a side or filler and making it the star. You can’t spend much time here on my site without tripping over a curry recipe of some description. Vegetarian curries are always a real star, my aloo gobi, a potato and cauliflower curry is an all-time favourite of mine! Vegetables always play well with spices and heat. Often acting like a sponge soaking up flavours whilst still retaining their character. A classic example of this is the humble chickpea as in this Indian Chole recipe. Returning to the spud again we also have this ‘saag’ aloo recipe. Whatever you do when you think curry, do not think only chicken, beef or lamb! After our initial first foray into pumpkin recipes with this pumpkin curry. And our subsequent experiments we decided we would plant some and see how we got on. Let’s just say we will not be needing to buy any more this year, we must have over one hundred butternut squash. We always end up doing this with new crops because we are ‘numpty’ farmers. We genuinely have no idea what we are doing. Learning from experience is our mojo, so we put things in the ground and learn from results. Consequently, gluts and droughts are nothing new to us. One year we managed to grow nigh on half a tonne of carrots! We could not get rid of them no matter what we did. Out of desperation not to throw stuff away we even tried carrot wine. Trust me not a thing you want to do. I will certainly will not be trying pumpkin wine either. So enjoy this pumpkin recipe and brace yourself for at least a couple more like this pumpkin risotto over winter! They really are so tasty. I’m a pumpkin addict so this is extremely intriguing to me! So many great spices and flavors going on. Perfect! 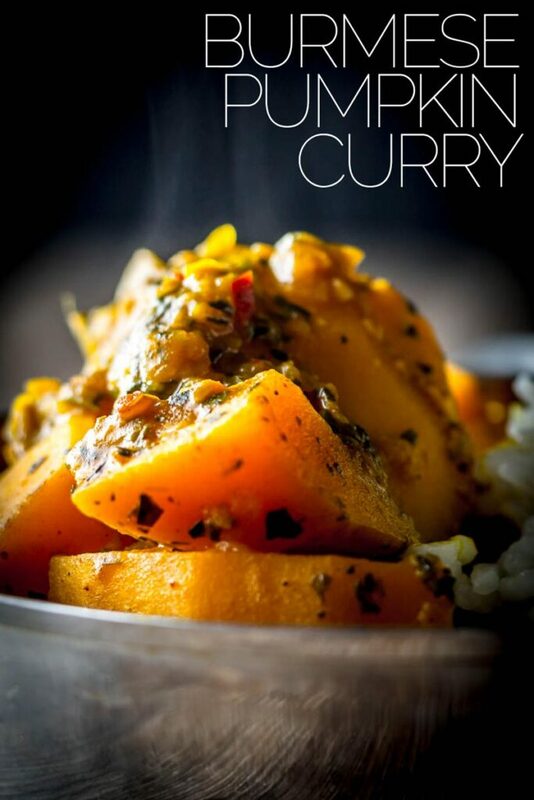 I do love pumpkin so will definitely have to try it in a curry – looks and sounds absolutely delicious. Love that it only takes a short while to make too! It is really quick and proper tasty. Cooking with veggies you’ve grown yourself must be an amazing feeling, not to mention absolutely delicious. I envy you! It certainly is Marie, although it just feels normal now as we have been doing it for so long. You might be a pumpkin newbie but this curry sounds glorious! In Sri Lanka, pumpkin curry with tamarind is very popular and this one you have here is making me wish I had some right now. Well there yoU go, you learn something new every week… Thanks Shashi. amazing recipe! I cooked this for my family and they LOVED IT. I’ve never had Burmese food, but this looks fab! I did meet a guy from Burma last summer, but unfortunately he was on his way back to Myanmar. So I guess I’ll just have to make this! This tastes wonderful and you should have most of the ingredients based on what you cook 🙂 I name checked the book in the post and it is well worth hunting down, some really great recipes in there! It’s been a few years since I’ve had actual pumpkin. Now, I’m craving it! I’ve had pureed pumpkin and pumpkin seeds, but not big chunks of whole pumpkin. Looks great, B! LOL at the carrot wine! I am a pumpkin newbie too! I’ve never really cooked with it, even though it’s all I see during the fall! Your curry looks amazing, I’m a such a huge fan of curry. I’m sure the pumpkin adds an awesome flavor & texture! You went and mentioned it again, I still have nightmares about ‘C’ wine shhhhhhh! Thank you the flavours in this dish are amazing, we love it! Thank you, it really is a special one, I love tamarind and the sour earthiness plays really well against the sweetness of pumpkin. Ha ha, I am so sorry 😉 This is a great dish and the one I credit with my current love of pumpkin… I am rather envious of your 25 mile away restaurant, I have not found a Burmese restaurant in Hungary at all! This looks so comforting and delicious, those flavors really go together! Thanks Sara, the flavours really were wonderfully complex for such a simple dish. Brian, another really nice recipe with your usual great pictures. I think pumpkin is so underrated and I love using tamarind. Yes a really good one for autumn (although it is spring here)! Cheers. Thanks Mark, this is opnly my second year cooking pumpkin, I had convinced myself I didn’t like it for years after too many really poor pumpkin soups… But it is the most incredibly versatile vegetable and I now love it! Oooh I’m loving these flavors. Especially the chili shrimp paste, I had no idea such a thing existed. Yum. 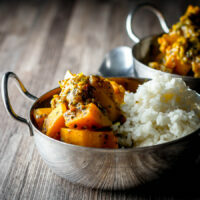 I really love the idea of pumpkin curry! Your bowls you served it in, is so cute!! I’ve been thinking a pumpkin curry would be nice this fall, thanks for the good ideas here! Your welcome David, I am always looking for new pumpkin ideas as I am fairly new to cooking with them but this is definitely one of my favourites. But as soon as I knew how to cut it correctly i already felt most people a step ahead. This curry looks really good!! Cheers Howie, I struggled with pumpkin cutting too… I went through more than a couple of band aids but I am really on top of it now and it is a favourite Autumnal vegetable. I’m with you… I much prefer savory pumpkin over sweet! What a great recipe, and even better pictures! Beautiful! Thanks Heather, I’m one of them odd folk that love everything savoury, sweet not so much… However a touch of sweet with savoury is my heaven. I love tamarind. This flavor combinations sounds like a great balance of sweet and sour. Thanks Mary, it works really well and the mint gives it a lovely lift too. I love that you’ve made a savory pumpkin dish. As much as I’m loving all the pumpkin treats, I think I need to back away from the honey pot for a bit and eat some REAL FOOD. 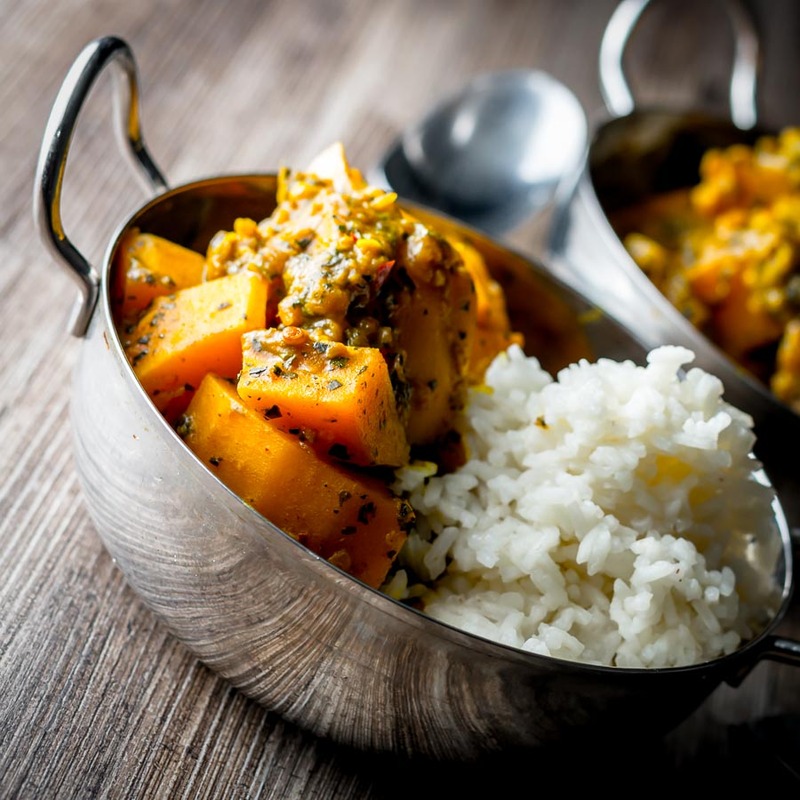 This pumpkin curry is the perfect place to start!